Feeding people is a favourite pastime of my mother’s and she is a master at it. What’s more - I think fewer things give her more delight than seeing my usual healthy food habits slip into an abyss of minstrels, Percy pigs and crisps. You know exactly what I mean though right? The trouble is though - it doesn’t always leave me feeling so great. ALWAYS is the key word there though. 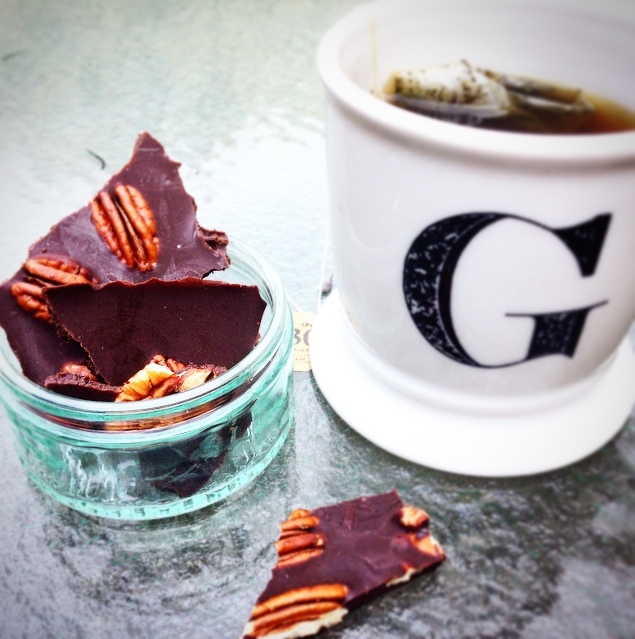 Because sometimes, these indulgences (that so reflect love in my family), they truly do feel like a delicious indulgence - no guilt, no real detriment to health, no challenge to my energy and so on. Other times though, they feel like sh*%. I love this recipe because not only does it end up the most amazing bright pink, it's also SO brilliantly versatile. Whatever root veggies you have to hand - just roast them and blend them up - so simple. Whilst beetroot isn't always everyones favourite, I personally think the spices in this mask some of that 'earthiness' and the sweetness from the other veggies make it almost decadent in flavour. And with beets being so packed with anti-inflammatory and immune-boosting nutrients, it's certainly worth giving this a go! White potatoes are a rare occasion chez Muir, but this Indian curry is an old favourite so still comes out every now and then. It's truly scrumptious and the herbs and spices pack a health punch that the spuds are lacking. It's high time these bad boys were shared with the world - quite frankly it's a culinary crime that i've kept them to myself this long! I love to make these obscenely garlicky, heavy on the seasoning, and consider all rules of 'protein portioning' out the window i.e. eat all 6 and I won't judge you! Oh my goodness, I've just realised it's PANCAKE DAY! The one day of the year that it's perfectly acceptable to throw food around the kitchen and have sweet treats for dinner. YES! Pancake day was never surpassed in our house when growing up; thin or thick, sweet or savoury (always sweet! ), lemon and sugar or Nutella and banana - Mum had pancake day down to a fine art! Homemade pestos are super healthy too FYI. Genuinely a great way to sneak plant-based protein, healthy fats and nutrient-rich herbs into your day, especially when teamed with a plant-based pasta substitute such as with this pesto courgetti! Who doesn't love a good crumble? Baking and deserts have never really been my forte, but a crumble is just so easy, you can count me in! This blueberry, strawberry and apple coconut crumble is super easy, has no dairy, no gluten, no refined sugars - just wholesome goodness. I love to serve it up with some coconut ice cream or eat it cold the next day! Oh boy is this yummy. The sweet, nutty flavour of the roasted squash with the spiced, herby bison filling work beautifully. And for all those who are a fan of simple things - this dish is super versatile; any type of squash and any type of ground meat and it still works brilliantly! GUIDE TO GREEN SMOOTHIE DIY! It may be 110 degrees outside (43C) and humidity may be soaring, but in my world - crumble is always welcome. Not only does it give me a wonderful excuse to indulge in some coconut ice cream (you can't have crumble without ice cream), it is also a brilliant crowd-pleaser to whip up for a dinner party - quick, easy and hassle free! Bread? - not so much, but soups, stews, super tasty quinoa, and a body-nourishing, gut-healing drink? - Absolutely! This ugly broth with an unfortunate name is in fact yum-scrum and packs a health punch of the highest calibre. Bone broth is really just the homemade stock of yesteryear, but one that has been cooked a little longer - the extra hours are the key to extracting all those deeply nourishing nutrients from the bones. It is delicious, extraordinarily nutritious and beats store-bought stock cubes/broth/bouillon hands down. It is incredibly healthy, inexpensive and if you aren’t already making this stuff by the bucket load, I encourage you to START TODAY! I’m all about the DOs and CANs in health rather than the don’ts and can’ts. So if I tell you that most commercial cereals, even the supposedly 'healthy' ones, are highly processed and loaded with RUBBISH, but then offer a delicious and healthy granola recipe, I’m hoping you read between the lines and start substituting this ‘DO’ into your life. 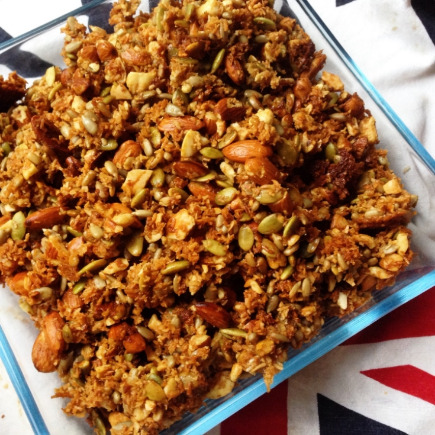 Protein rich, full of goodness and a truly scrumptious paleo granola. Sooo I’m breaking all the blogger ‘rules’ today and steering away from my VERY SERIOUS blog schedule to share this scrummy recipe with you – it's so simple and delicious I just couldn’t wait! 6 HEALTHY ALTERNATIVES TO YOUR EVERDAY CARBOHYDRATES FOR A WINNING RECIPE REPETOIRE.